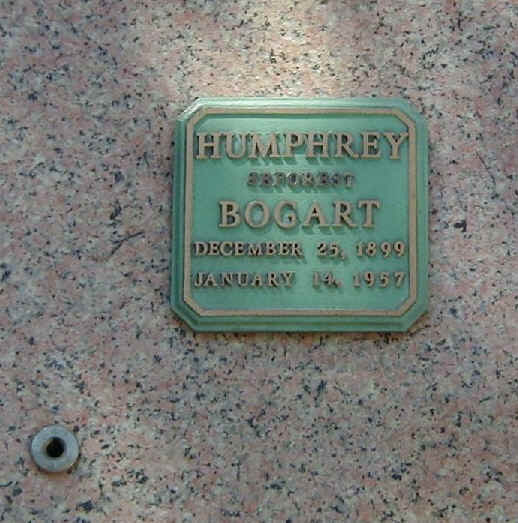 Mr. Humphrey DeForest Bogart to Maud and DeForest Bogart. His mother was an artist and illustrator, using her maiden name Humphrey professionally. His father was a surgeon. Both parents were alcoholics. Early in the spring of 1918 he enlisted in the Navy, hopeful of seeing France during WWI. Bogie started working in theater during the 20's and landed bit parts in the movies through out the early 1930's. Often portraying men with at best dubious pasts, he brought each a rich and complex depth that has stood for the "film noir" era of Hollywood. During the years of 1943-1949 he was ranked with the top ten biggest box office draws and was one of the highest paid actors of his day. During those years, he also co-starred with a young model just breaking into the movies named Lauren Bacall. Though many years her senior, they fell hopelessly in love and after a messy divorce to then wife Mayo. Bogie married Lauren in 1945. They starred together in five pictures together, before Lauren temporarily retired to raise their two children, Steven and Leslie. The years Bogart and Bacall spent together were his happiest. On October 24, 1947 , 50 of Hollywood's writers, producers, and actors charted a plane to fly to Washington D.C. to express their displeasure with House Un-American Activities Committee investigation in Hollywood. The committee for the first amendment not only tried to protect the rights of the "Hollywood Ten", but also to protest the violation of the Constitutional rights. The group held press conferences in Kansas City, St. Louis, Chicago and finally in Washington D.C. outside the doors of HUAC. However, the committee didn't achieve anything, but brought trouble for some of it's members. John Huston said this of Bogart in his eulogy, "He was endowed with the greatest gift a man can have--talent. The whole world came to recognize it...His life, though not a long one measured in years, was a rich full life...We have no reason to feel any sorrow for him--only for ourselves for having lost him. He is quite irreplaceable, there will never be anybody like him"